My reviews of gear, fuel, and all things fitness. Have something for me to check out? Email me at info@TribeFitness.ca. While Ophea’s 50 Fitness Activity Cards have been a much loved tool by teachers in the classroom and adults working with children and youth, have you ever considered using them in your office, or work setting, to get the adults in your workplace moving? 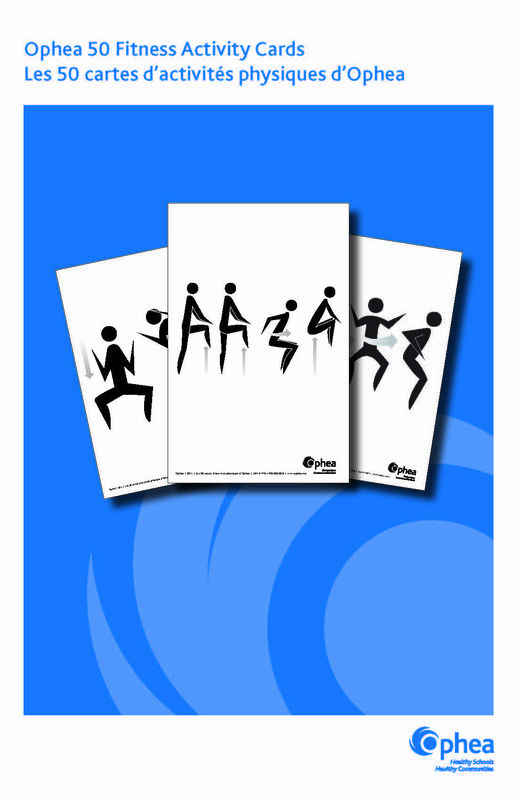 Here are 5 ways you can integrate Ophea’s 50 Fitness Activity Cards into your workplace (e.g. during staff meetings, mid-morning surprise energizers, lunch, etc.). 1. Meeting Minute Movements: Randomly select 6 cards from Ophea’s 50 Fitness Activity Cards. Display the 6 cards in a place where all participants in the meeting can see them. Together all participants in the meeting perform each activity to the best of their ability for ten seconds, therefore moving for a total time of one minute. Consider having multiple breaks, and even choose optional cards for those who might want to perform an alternate movement. Round 1: Participants count to three by taking turns. Partner A says ‘1’, Partner B says ‘2’, Partner A says ‘3’, Partner B says ‘1’, and so on. Have them repeat this pattern for several seconds. Round 2: Participants count to three but replace the ‘1’ with the first 50 Fitness Activity Card (e.g., jumping jack). Round 3: Participants count to three but replace the ‘1’ with the first 50 Fitness Activity Card (e.g., jumping jack) and the ‘2’ with the second 50 Fitness Activity Card (e.g., tuck jump). Round 4: Participants count to three but replace the ‘1’ with the first 50 Fitness Activity Card (e.g., jumping jack), the ‘2’ with the second 50 Fitness Activity Card (e.g., tuck jump), and the ‘3’ with the third 50 Fitness Activity Card (e.g., squat). 4. Fire 5/10: As a group select three of Ophea’s 50 Fitness Activity Cards. In pairs participants face each other with 1 or 2 hands hidden behind their back. On the signal “1, 2, show” participants reveal their hands with any number of fingers showing. Participants add up the fingers of both/all hands as quickly as possible, with the goal to shout out the correct answer first. Participants perform the corresponding Ophea 50 Fitness Activity Card based on whether they shouted out the correct response first (e.g., if they answered correctly first they perform “Chicken jacks”, if they shouted the answer second: “Squat kicks”, and if it was a tie they perform “Coffee grinders”. 5. Station Scatter: Display 10 of Ophea’s 50 Fitness Activity Cards around the meeting room. Participants perform 10 repetitions of each card as quickly as possible before moving on to the next card. Participants can complete the cards in any order with the goal of completing as many cards as possible. Do you have more tips on keeping active at work? Share them with us on Twitter @PARCOntario using #PARCBlog! This post originally appeard on the PARC Blog September 20, 2017. View the original post here.